The leaves and twigs of the Witch Hazel tree are steam distilled. A small amount of alcohol is added as a preservative. 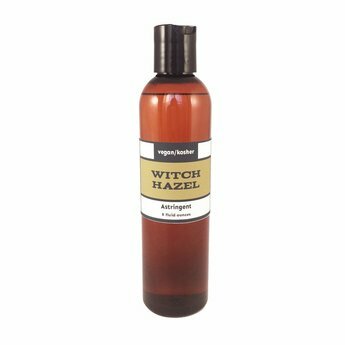 Witch Hazel is one of the best natural astringents for use on sensitive skin. It is gentle enough to be used alone, but makes a wonderful base in liniments, facial toners, aftershaves, and many other skincare products. Its astringent properties are well suited for use on engorged, aggravated, or inflamed skin. The nickname Snapping Hazel or Snapping Hazelnut originates from the interesting way in which Witch Hazel’s seeds split explosively propelling seeds to distances of up to 30 feet! Store in a cool, dark location in a sealed container. Witch hazel extract does contain a small amount of alcohol as a preservative (13-14% in ours) so use caution around the eyes and mouth. For external use only.